Digital pressure gauge with 4 to 20 mA output for pipe mounted use in synthetic hydraulic oil measurement applications, capable of measuring 0 to 250 psi g pressure with 1% accuracy and connected using a G1/2 male fitting. A combined digital readout unit and pressure sensor for mounting on a pipe to measure synthetic hydraulic oil pressure over 0 to 250 pounds per square inch gauge to an accuracy better than 1%. 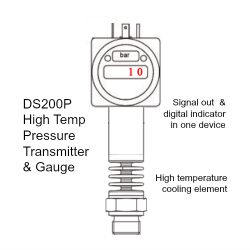 This DS200P digital pressure gauge with 4-20mA output is powered by an external power source and is connected to the physical pressure measurement point using a G1/2 male thread process fitting. Accessible external connections are provided to the 4 to 20 milliamp analog output for sending pressure readings to other nearby instrumentation. 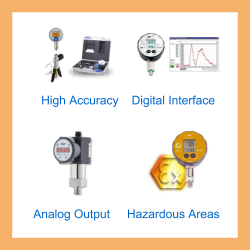 Extra capability for high temperature media protection is incorporated into the digital pressure gauge to adapt it for the intended application. Please complete form below to request a quote for 250psig hi-temp hydraulic oil digital pressure gauge and 4-20mA output. Send us your enquiry for 250psig hi-temp hydraulic oil digital pressure gauge and 4-20mA output to get assistance with this product type.